Obesity - Counting Calories is not the answer - The truth about food and medicines. People trying to lose weight are often disappointed at their lack of success. One of the reasons for their failure is that they have usually been advised to restrict their calorie intake. However, this advice ignores one very important aspect and that is whether the food eaten is refined or unrefined. The difference is of prime importance because one can very easily overeat refined food but it is difficult to overeat unrefined food. The main culprits are refined sugar and white flour products. To demonstrate how misleading counting calories can be you only have to compare a teaspoon of sugar with a whole apple, as both contain roughly the same number of calories. One could easily consume too much sugar but not apples. Natural unprocessed food fills the stomach and satisfies the appetite. It takes time to digest thus providing slow release energy whereas sugar produces a peak and then you feel hungry again and crave more food. So what exactly qualifies as unrefined food? The answer is food that has not been altered or processed. To take an extreme example, a whole unpeeled apple is unrefined but the minute you peel off the skin before you eat it, it becomes refined because the natural fibre has been removed. 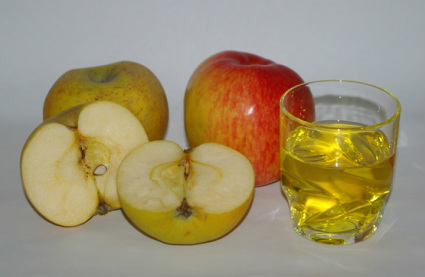 In the same way, drinking a small glass of apple juice is equivalent to the juice of several apples, but how many people could cheerfully consume 3 whole apples before sitting down to a meal? The key to losing weight is to eat only unrefined food and avoid sugar as much as possibly and everything containing refined sugar and white flour such as biscuits and cakes. Instead, eat natural, unprocessed food especially 100% wholemeal bread (preferably home made - click for quick and easy recipe), as many whole vegetables as you like, especially green leaf ones and raw vegetables where possible, a medium size portion of meat or fish, pulses, nuts and whole raw fruit. Surgeon Captain Cleave observed, “Obesity stems from the appetite being deceived by the unnatural concentration present in white flour and in sugar, so that a person eats too much…..Once the natural fibre is restored to the diet the natural dilution is restored also. As a result the appetite can again be allowed to regulate the amount eaten, as it is designed to do, and we can ignore any question of calories, just as all creatures in the wild state ignore them (and they never suffer from overweight)".